Preparing for unleaded petrol - cylinder head, carburettors and ignition system. In January 2000 the sale of leaded petrol in this country was banned. This had happened earlier in Western Australia of all places, due probably to a teaspoonful of political ‘one-upmanship’, that was totally unnecessary. Shades of that old chestnut, the railway gauge saga! How, being a couple of months ahead in our least populace State, this early ban made any difference to our environment has to be questioned. Another example of wasting taxpayers’ hard earned cash, is all it can rightfully claim. The threat of leaded petrol being withdrawn from our pumps caused a fair amount of comment from all quarters. Our politicians, who knew nothing about how older cars would be affected by the withdrawal of leaded petrol, started campaigns telling us how ‘clean’ unleaded petrol would be – when, actually, the exhaust fumes are dirtier than they were with leaded petrol being used. We were also informed that lead replacement petrol (LRP) would be the total solution for older motor cars. Looking back, it was a time of blithely accepting what was served up and going with it. It permitted higher compression ratios due to its raising of the petrol’s octane rating. It helped lubricate engine valve stems. It was a cleaner burn fuel, leaving minimal combustion deposits. It prevented the growth of algae in the petrol tank. It did not affect flexible petrol hoses or pump diaphragms. It kept the petrol’s octane rating up during lengthy periods of vehicle non use. However, aside from all of these benefits, it caused photo-chemical smog – particularly in a place called Los Angeles, and it was this place that caused the swing away from leaded petrol. It has been said that it would have been easier, and cheaper, to have moved Los Angeles to a better geophysical location! That being said, a little tongue-in-cheek, with the sudden huge increase of motor vehicles world wide – something had to be done, and drastically quickly. For the enthusiast running older cars, typically 1950s through to 1980s models, there was a fair amount of concern. Some fears were well founded and some were not. We need to look at the overall scene to appreciate how we are really affected. It has to be said that our fifty-plus year-old Jowetts are no longer used as daily runners, and they have also survived the ‘being run into the ground’ stage and, are now at the point where they are being looked after much better than they have been in their lifetime. With the blanket banning of leaded petrol, the automotive industry sought some major design changes. Joe Public was not expecting a drop-off in performance and, for this reason, new engine ‘management’ systems and petrols have been developed. This development has been most effective in rendering the faithful old carburettor and petrol pump as being obsolete. Fuel injection, mostly electrically controlled, has replaced the humble carburettor. It has to be said that the carburettor was always just a compromise with respect to providing an air/petrol mixture that was ideal for all conditions. Because modern fuel injection systems are controlled by a myriad of sensors and evaluators, the amount of petrol injected can be very precisely measured for virtually every known engine operating condition. It is for this reason that modern petrol has changed so greatly. Modern petrol is denser and therefore will, unless steps are taken, give symptoms of rich running. Modern petrol also has a lower boiling point and, with a Jowett engine, this matters somewhat. Today’s petrols also have a detrimental effect on older petrol hoses and fuel pump diaphragms which are known to become expanded and distorted. Owners of older motor cars need to be aware of these concerns that affect fuel systems. In a response to questions put by the Association of Motoring Clubs, Shell responded that their Optimax does promote algal growth if left for long periods with some water in the tank, the response also stated that Optimax fuel had a shelf life of approximately thirty days and that Optimax and copper did not go well together. Modern petrols also burn more fiercely in the engine’s combustion chambers and this could lead to engine overheating concerns. All is not the absolute disaster that was predicted in the late 1990s. Our Jowetts can cope admirably well when using modern petrol. It should be remembered that the Jowett engine was originally designed to run on ‘Pool’ petrol that was available in Britain just after WW II. However, in those days, motorists did not have the expectations that their modern counterparts expect today. In the late 1940s and early 1950s it was ‘normal practice’ for an enthusiast motorist to ‘do’ the plugs and points before a journey of more than a hundred miles. It was also normal to perform a decarbonizing activity at intervals of 18,000 to 25,000 miles, hence strong sales of decoke gasket sets in those days. A ‘decoke’ was, for home mechanics, a common weekend activity. Fortunately that is not the case today! With steady, relaxed driving, a Jowett engine should be able to run reliably on standard unleaded petrol. There is a gross misunderstanding that these engines require premium grade unleaded petrol. If the compression ratio of an engine is below 9:1, premium petrol is not required at all. In fact, the low compression engine will perform no better on a higher octane petrol, simply because it does not have the compression ratio that demands anti-pre-ignition characteristics of higher octane ratings. Such a statement requires a degree of qualification though. Experience has shown, with a Jowett engine, that the exhaust pipe is much cleaner when a petrol such as BP Ultimate is used. On the same motor car, the exhaust was very soot affected when standard unleaded petrol was used for a period of time. It is also true that, while using Shell Optimax exclusively for an extended period, the exhaust pipe was severely soot affected – particularly if the Optimax petrol had aged. It is horrifying to observe that heavy deposits of soot in the exhaust pipe also mean particles of soot being discharged into the atmosphere. Clean fuel? Not so! 1. The needle and seats in both carburettors need to be in very good condition. 2. Petrol delivery pressure should be below 2 psi. The Zenith carburettor has a float that acts directly on the float chamber needle and seat. There is no leverage as in most other types of carburettor. This is quite important, because of the inherent denseness of modern petrol, any additional fuel supply, due to poor needle and seat performance, will certainly compound the perceived richness of the petrol-air mixture and will be seen as carburettor flooding. It is a sound idea to install a fuel pressure regulator on the delivery side of the petrol pump. Another method of controlling fuel pressure on a Javelin is to install an electric petrol pump and install at the same time a by-pass loop from the delivery side of the pump, that passes surplus petrol to the inlet side of the pump. This involves extra plumbing, but it is worthwhile. 3. With the carburettor’s close proximity to the cylinder head, after a hot engine is switched off and is affected by heat surge and then short-term higher temperature stabilization, the petrol in the carburettor will boil away. This gives fuel starvation symptoms when an attempt is made to re-start the engine. At low cranking speeds, this condition can lead to carburettor flooding. An electric petrol pump, as fitted to the Jupiter model, will automatically compensate for this. 4. To every tank full of unleaded petrol, add 50 – 80 ml of pure upper cylinder lubricant. This is to prevent the valves from sticking in the valve guides. On a Jowett engine, after a long period of full throttle work (hill climbing) the inlet valve stem will be washed clean with the amount of petrol vapour passing through the inlet port. Once lesser throttle openings are used (coasting down hill) an inlet valve could stick in the open position. This condition usually occurs at number three inlet valve. Upper cylinder lubricant will help prevent such incidents happening. If genuine upper cylinder lubricant can’t be obtained, a dose of two-stroke oil for mixing with petrol will suffice and keep valve stems lubricated. 5. Long periods of running at over 60 mph should be avoided if consideration is being given to exhaust valve seat recession. 6. Thankfully, lead replacement petrol is no longer available. It never did entirely prevent valve seat recession and its long term effects on an engine were not known. The additives used in lead replacement petrol contained elements of sodium and potassium and the main concern with these was, how did they affect an engine’s internal components if it was left standing unused for long periods? Lead replacement petrol’s acronym LRP soon came to stand for ‘Lousy Rotten Petrol’. 7. There could be petrol starvation symptoms due to the deterioration of rubber components in the fuel system. On the Jowett, the braided petrol hose, located on the suction side of the pump, could suffer from rubber hose liner collapse due to the suction of the petrol pump. This is particularly so if there is a partial blockage at the pick up in the petrol tank. Lack of petrol delivery performance can manifest itself if the pump diaphragm is softened due to incompatibility with modern fuels. There are steps that can be taken to ensure reliable, fast running of a Jowett engine that is fuelled by unleaded petrol. These steps are considered by most Jowett owners to be extremely expensive. To a certain extent that could be true, however, the upgrading of an engine to operate economically and reliably on unleaded petrol can also be seen as a value-adding investment. Peace of mind counts a great deal in this too. The economics of converting an engine can dictate that the conversion be undertaken at the engine’s next major overhaul. If this course of action is undertaken, then serious consideration should be given to making desirable changes to the engine at overhaul time. 1. Polishing the combustion chambers in the cylinder heads to a smooth finish. 2. Install hardened valve seat inserts. This should be carried out by a specialist workshop. 3. Bore out and install bronze liners in the valve guides. This should be carried out by a specialist workshop. 4. Install stainless steel valves. There are a number of forged blanks from which valves to suit the Jowett engine can be machined. Again, specialist workshops can do this work. 5. Smooth away surplus sparking plug thread that shows in the combustion chamber, after the correct plug has been screwed in fully home. The ‘peaks’ of the thread can glow red hot and cause pre-ignition and running on after the engine is switched off concerns. These threads can be cleaned away by using a small die grinder. 6. Install Champion L87-YC sparking plugs. This model replaces the original L10 plug. It also has the feature of having an extended core nose that places the spark further into the combustion chamber. When installing these plugs, it is advisable to check that the valves do not clash with the extended nose of the plug. 7. Fine tune the ignition timing during road test to prevent detonation. 8. Replace those rubber fuel system components that could be affected by modern petrol. 9. Have the carburettors thoroughly overhauled and set up to provide optimum running on denser petrol. 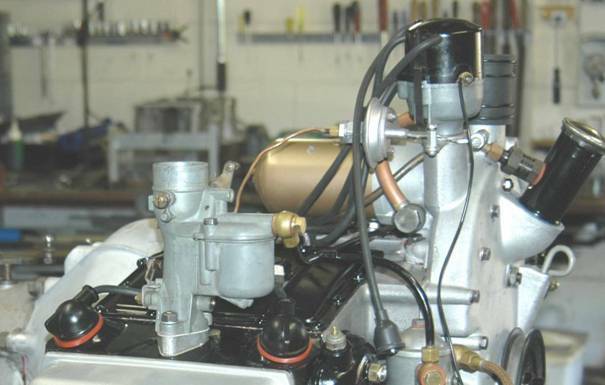 The carburettors should be set and tuned with an exhaust gas analyser. Specialist workshops can do this. 10. Install a fuel pressure regulator. Zenith carburettors can only handle a maximum of 2 psi fuel pressure comfortably. Petrol pump repair kits have been rationalised and seem to err on the high pressure side which can affect the mixture. A fuel pressure regulator that is compatible with unleaded petrol should be used. There are several types of petrol additive on the market that claim to stop valve seat recession. We all have to be somewhat dubious about claims for some of these ‘wonder’ products. The late John Dymond, then managing Director of the Penrite Oil Company, and himself a very knowledgeable ex-BP chemist, presented a very interesting talk to car club Delegates at an AOMC Information Day on the subject of valve seat recession and the products that claimed to prevent the phenomenon. This session held everyone’s attention. Essentially, John reassured those present that there was not too much to worry about, with respect to the phasing out of leaded petrol. The main advice given was to run the car on straight unleaded petrol and add a valve seat recession prevention additive. Don’t purchase LRP, was the real message, due to the various fuel companies using differing additives. The best prevention method would be to stay with just one additive brand at all times. A cynic would say that John was selling Penrite’s own additive, but there was a heap of sense in what John said that day. In tank or inline fuel catalysts – in the years leading up to the withdrawal of leaded petrol, there was quite a campaign for tin particle catalysts. These wonder devices were advertised in such a way that some thought, “Why on earth isn’t the world’s entire automotive industry installing these devices as original equipment?” It was estimated that, for a device to match a 1½ litre engine, and for the period it was claimed to provide protection for – a seven tonne truckload of tin would have to be carried by the vehicle. Upper cylinder type oil additives – there are a couple of these on the market. One is cleverly attached to the intake manifold with a vacuum operated metering device. Having looked closely at such a unit, it was felt that a Jowett engine would need two such units, having one unit meter into the balance pipe not being a very dependable option. Contact was made with the supplier and there was no response to questions about which additive was used to help prevent valve seat recession. Another supplier of a similar system, makes so many claims about the product boosting octane ratings, improving fuel consumption and boosting engine performance to such an extent that, again, we have to wonder why the automotive industry is not installing this product on to every motor car manufactured? Liquid additives – there are several of these on the shelves at service stations. The Federation of British Historic Vehicle Clubs carried out exhaustive tests on a Leyland ‘A’ Series (Mini and MG Midget) engine (most prone to valve seat recession) and resolved that the Valvemaster product was probably the best, closely followed by a Millers product. These additives are fairly expensive and, depending on vehicle use, it could work out more expensive in the longer term than installing hardened valve seats and stainless steel valves. As can be seen, there is no real difficulty with respect to running a Jowett engine on unleaded petrol. The engine in the author’s Jupiter, and now in use in his Javelin, has covered 30,000 miles on unleaded petrol. No special changes were made to the engine and only pure upper cylinder lubricant was added to the petrol at each tank fill. There was one instance of a sticking inlet valve after a long burst of full throttle work. The engine currently in the Jupiter has been converted to use unleaded petrol, but it still receives a dose of upper cylinder lubricant – for peace of mind while on the open road, and that is what it is all about.